So it’s the night before I catch my flight down to Atlanta. The past three and a half weeks have been an absolute whirlwind. Just a short time ago, I was a man with an apartment in Hoboken and a rocking job. And now I’m about to become an unkempt dude who’s day is made up of walking many miles per day. 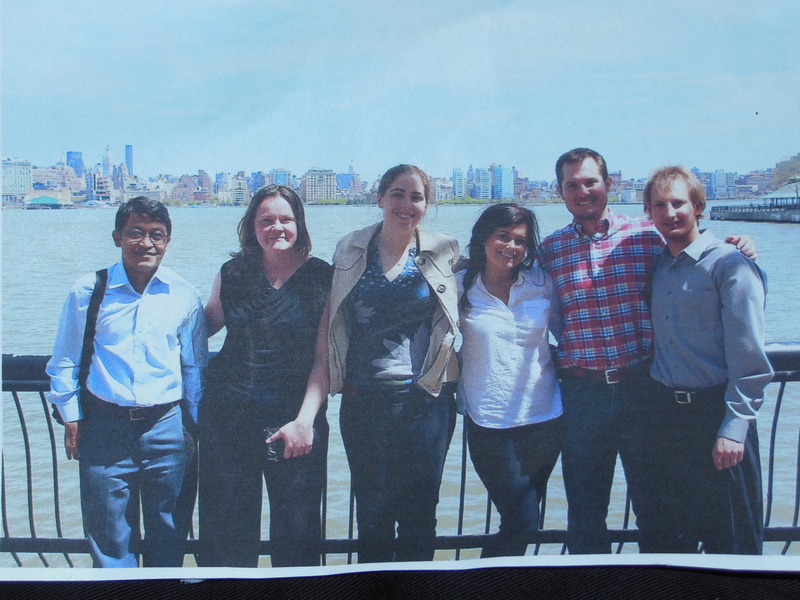 Leaving Hoboken was one of the toughest decisions in this whole process. Not only did I leave a great city, I left a great job, and above all, I left great people. Everyone was awesome as I told them about my crazy proposed journey. I got a lot of raised eyebrows, but they were always followed by warm words and smiles. And another awesome thing – I finally got to meet Kiran, who I’ve worked with so closely over the past two years, but never met in person! It was a great experience to be able to meet up with him after all this time. There’s Kiran on the left, along with my other (former) 🙁 coworkers – Laura, Erica, Jenny, my brother Matt, and then me on the right. So I just wanted to say thanks to everyone up in Hoboken. I wish I had some more pictures, especially of my Thursday night party! It was awesome seeing Meg, Bill and Falco before I left. And I can’t forget John – you are a great friend. I can’t name everyone here, but you know who you all are. 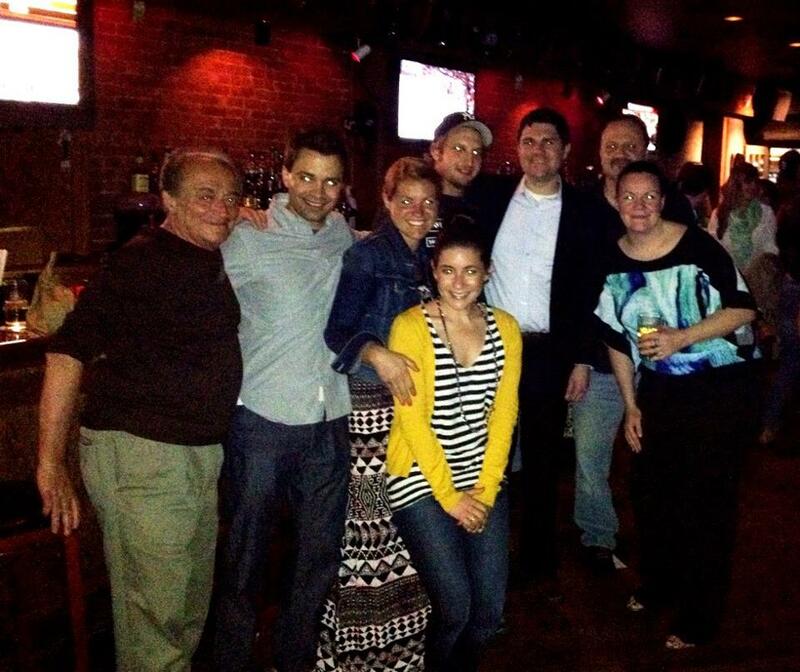 Each of you made Hoboken a very special place for me. I’ll see you all again soon I know! So it’s almost 10:30 the night before I catch my flight down to Atlanta. I spent the whole day running around like a lunatic getting last minute things. Steve Olson came over for dinner last night to answer tons of my questions (as well as my Mom’s). Steve did the trail last year, and has been invaluable to me as I’ve been preparing for this trip. Thanks dude. So I had to pick up a few last minute things in order to take into account Steve’s advice. I went to REI (twice), the foodstore, and a couple other places I can’t remember. 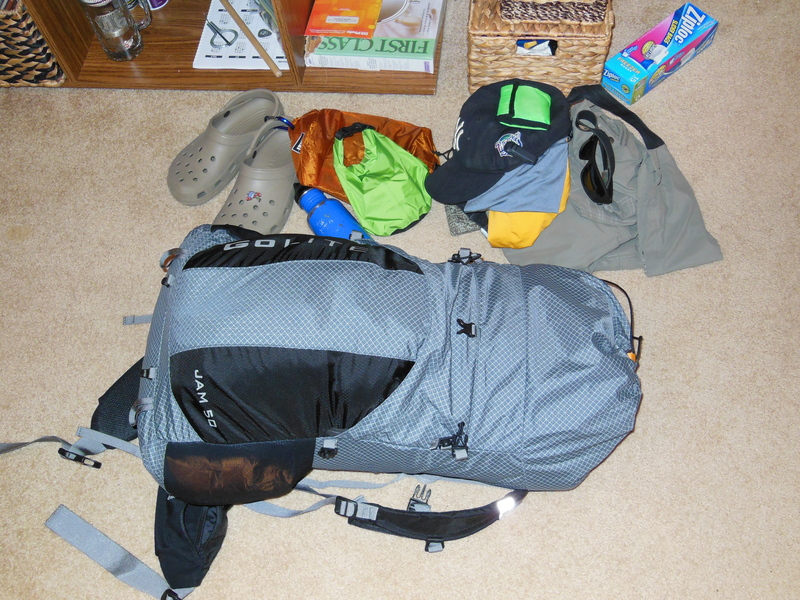 After all that, I packed up my pack, and came in a bit over 25 pounds, which I’m pretty happy with. I can probably lose some once I get out there. But I’m very happy to start out at sub-30. 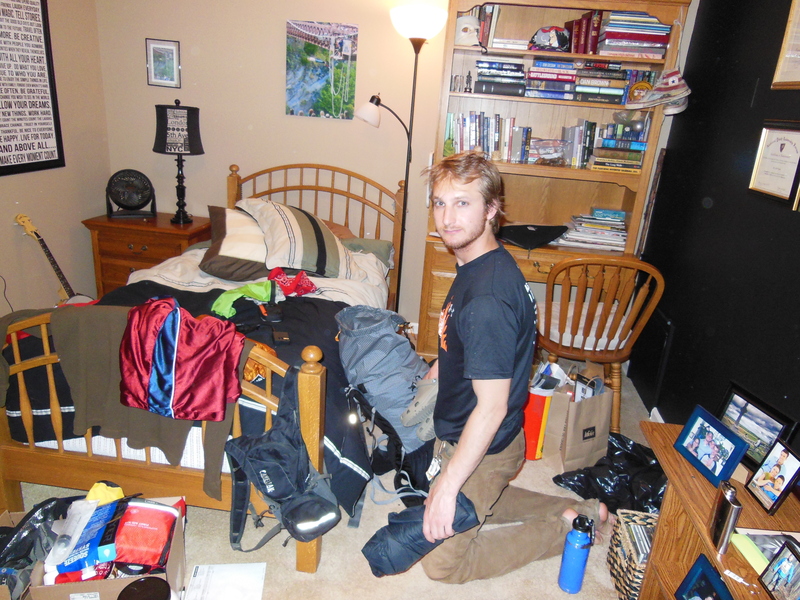 Here’s a picture of me as I was finishing up packing everything up, and then my pack and the stuff I’ll wear tomorrow. So that’s that. I guess I’m ready to go! Sorry this post was a little rushed, but it’s getting late and I need sleep! I’ll update when I can, I’m hoping within the next week or so. Talk to you guys soon! As some of you probably noticed, I failed to mention anything about the going away party at Jay’s in any of my earlier posts. No, I was not being forgetful. I just wanted to give that party, and the reason behind it, it’s proper place. 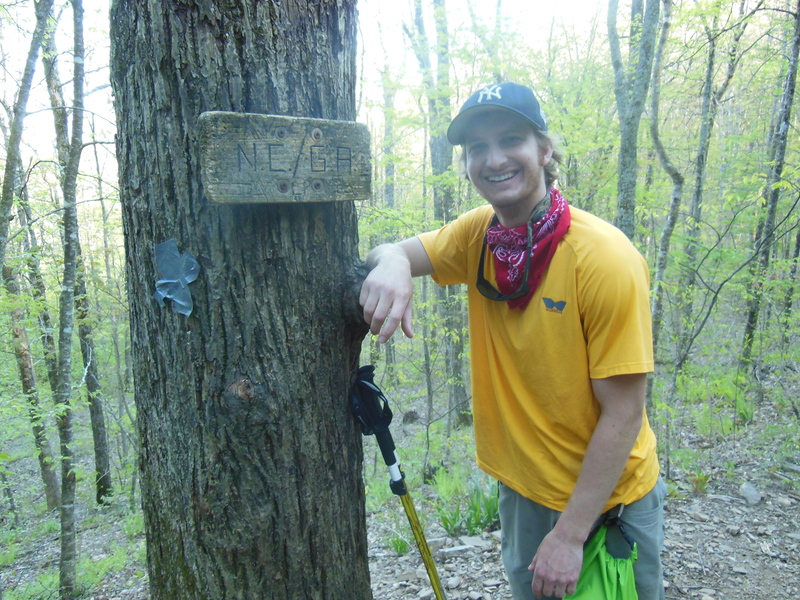 When I decided to do the Trail, aside from my parents, the only people that I initially told were my siblings, Matt, Paul, and D. My plan was going to be to tell a few people, and then kind of slip away into the foggy mountain dew. I didn’t want to make a big deal about leaving, or attempting the trip – not sure why. But anyway, that was what I thought was going to happen. Much to my surprise, my siblings threw an awesome going away party for me at Jay’s. Not only did they gather friends and family from around town, they got a bunch of UD guys to make the trip (thanks a ton for coming guys, that was awesome). I walked right into their sneaky trap – I had no idea what was going on! So what I really want to say here is that having people like them around you for your whole life is really something invaluable. It’s really amazing to see the things good brothers and sisters will do for each other. Although they foiled my plan of a sneaky exit into the mountain fog :), I greatly appreciate them getting everyone together for my sending off. It’s difficult to articulate or write what it means to me, but know that it’s truly something special. 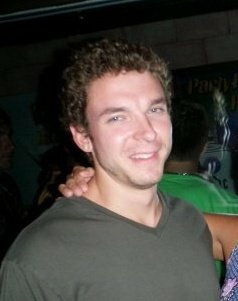 To have people gather to send me off with a few beers, although a relatively small act, is truly something powerful. And it has stuck with me through this journey, and will continue to be one of my fondest memories no matter where I go from here. Terrible Tang out here said something to me the other day that really resonated with me. We were talking about brothers and sisters and how growing up there was always a battle about something or other (he has 2 older sisters, and and older brother). He’s now about 35 or so, and like me, his siblings have become his best friends. He said something along the lines of “It takes time to realize what we truly have in siblings. You don’t just have brothers or sisters, you have people that you have literally shared your whole life with, from the very beginning, to the very end.” That is really something that is difficult to comprehend, but it’s something very special as well. So thanks for everything you’ve done, and everything you will do – I appreciate it with all my heart. So I am here at the Nantahala Outdoor Center (NOC), one of the cooler places I’ve seen. The trail runs right through it, so it’s a difficult place to avoid luckily. I’m taking my first zero day today to get some rest and some good food. Me and Tangy Booch Magoo (his name changed) sat at a bar here last night and ate a ton of food and some good beers. It was delicious. Today and tonight we’ll probably do more of the same. The walking finally caught up to me. My lower calves down into my achilles tendons have been pretty sore and a little swollen the past four or so days. I was expecting the aches and pains to come, but they came a little later than I thought, and a bit more extreme than I had hoped for. So taking the day off today, I’m hoping will be a big help. The trail is physically much more difficult than I thought it would be. There are some points where it’s like walking up huge steps (or down, which is worse). I understand why they say you can’t train for it now. It’s not just walking, you’re actively trekking, picking where each and every footfall should land. It’s a bit like trail running, especially when you’re moving a little more quickly going downhill. It’s fun, but it is tough. Two days ago, me and Tangy made a wrong turn on the trail. We wound up hiking about 2.5 miles on this other trail called the Bartram Trail. It was terrible. We should have known we were on the wrong one, but we kind of ignored the signs. Anyway, 2.5 miles out, and then 2.5 miles back made for a long and terrible day. It was pretty frustrating, but I knew I’d have to roll with some punches. It’s actually pretty funny because we’re staying in a building called the Bartram building now. I can’t get away from that guy. Yesterday included the most intense point of the adventure so far. I was walking along, and about six inches to the left of me, I saw the rattler of a snake. Needless to say, I got a bit scared and took a few steps backwards immediately. The rattle snake was probably about two feet long. Tangy came up behind me, and we began to plot how we can get around this thing. 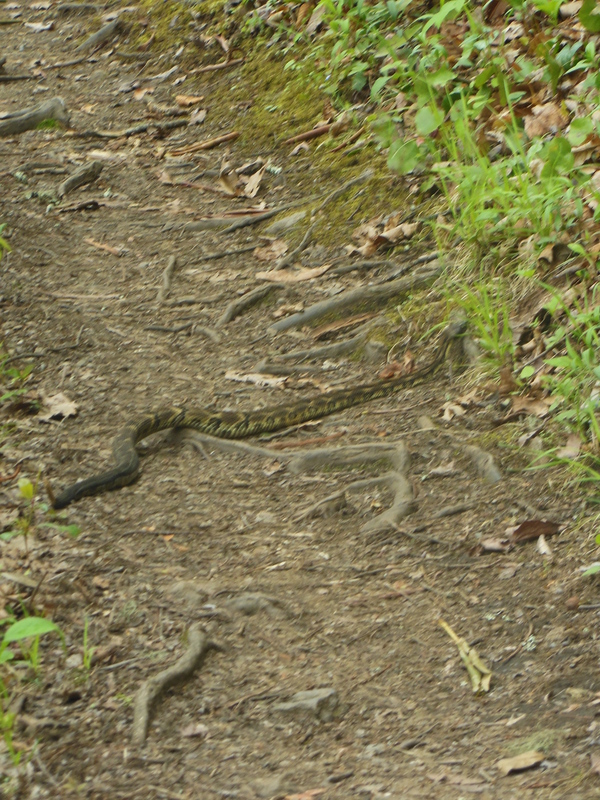 It was just slithering up the trail. After a couple of minutes, the snake got angry and started rattling. It was intense! Eventually he kind of went up the side of the trail, and me and Tangy ran past. It was a bit scary, but they are really neat creatures. The past five or so days since the last update have probably been the toughest for me so far, mostly due to the aches and pains. But there have been mostly awesome times so far. I camped next to a waterfall one night, I met a few other cool people, I got interviewed by some kid for his class, I’ve ate a lot of ibuprofen, I saw that snake, and I passed a couple of huge milestones. Firstly, I made it out of Georgia! And secondly, I made it into the triple digits of mileage atop Albert Mountain. I’m currently at about mile 137 or so. So it’s been awesome, I just hope my legs start feeling a little bit better! 🙂 Here’s me at the Georgia/North Carolina border. Before I started this journey, I was looking for reasons to not have to use trekking poles. They’re dorky and cheesey. I didn’t want to be stooging around the trail with two ski poles. I didn’t think I’d need them, and I didn’t want to use them. So I was going to go with a single pole, or staff, or whatever it is called. I went to REI to check them out, and that’s when I started to change my mind about the hiking world’s dorkiest, but possibly most important item. The REI guy told me a bunch of interesting facts that he probably made up. They were something along the lines of going uphill you save 35% of your energy, and downhill you can save up to 50%. I didn’t believe the guy at the time, I thought he was just trying to sell the trekking poles. Anyway, he succeeded, and I purchased some poles for use in my adventure. As I started my journey and I approached my first ascent, I realized just how much you can rely on these cheese tools. It really is amazing, even if you look like a full blown stooge. I thought my upper body would not get any work out on this trip, but I was dead wrong. Going uphill you can really drive with your back and shoulders through the poles. And coming downhill, you can control your descent and put some of the energy into the poles as opposed to your legs. That counts for something, especially now as I begin to feel the aches of walking many miles a day. So next time you see some dork roaming around with trekking poles, don’t think he’s a loser – because he’s probably a pretty cool stooge. Hello all! I have made it through the Smoky Mountains to the nice little town of Hot Springs, North Carolina. A lot has happened in the past week or so, and I haven’t had any access to internet or anything in that time, so I’ll try to recount all I’ve seen (including my first bear!). After taking the zero at the NOC (a zero is a day off), it was pretty tough to mentally get into trail mode. But after about a day, I was right back into the swing of things. What also threw me off the first day back on was the fact that I saw three cows and two little baby cows on the trail! I was not the only one who saw them, so I know they were real. 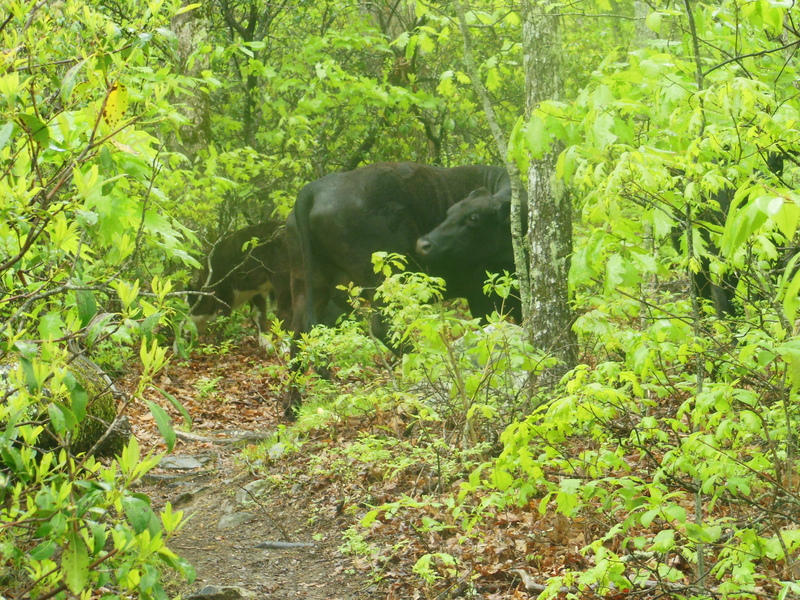 However, no one has really seen cows on the trail before, so we were quite a bit confused. 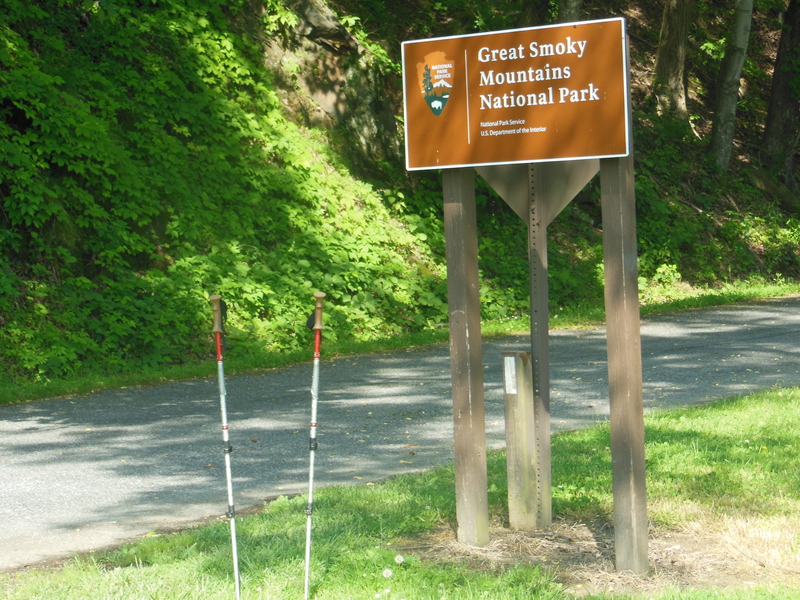 So after the whole cow encounter, I made my way into what is considered one of the tougher parts of the AT – the Smoky Mountains. The entrance to the Smokies is kind of cool. 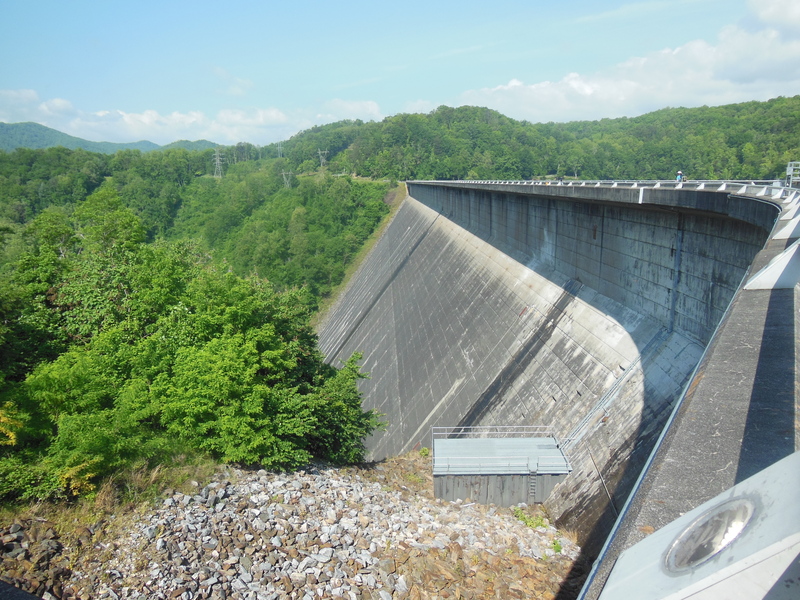 You go over Fontana Dam. I got a taste of some Trail Magic at the Fontana Dam Visitor Center. I was waiting around ‘til about 10am in order to pay a visit to the snack bar at the center. Unfortunately, the lady who runs it decided to not work that day. So this nice old lady who worked at the information booth gave me some Vienna Sausages (first time I ever had them – delicious), and an apple. She was awesome. 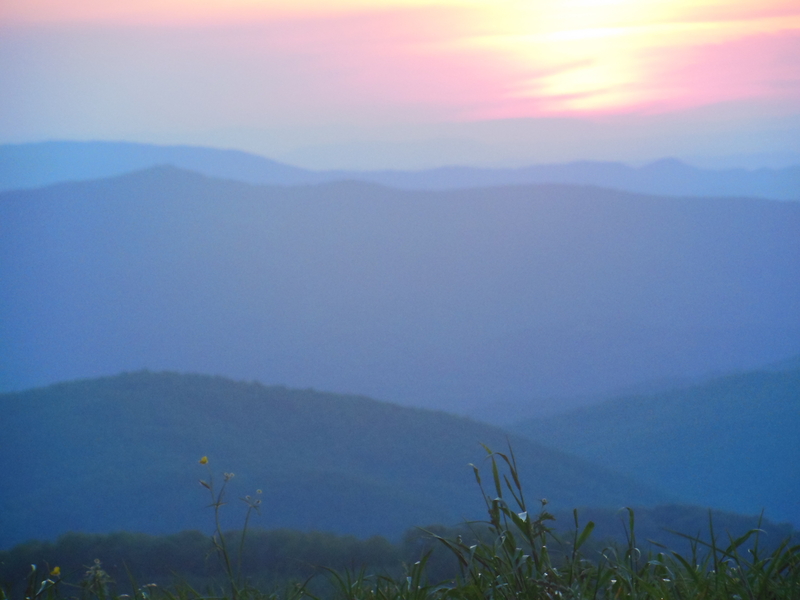 My five or so days in the Smokies were a bit of a mix I’d say. Terrible weather for most of the time didn’t allow me to see a lot of the nice views in the park unfortunately. A lot of really awkward stairs, bureaucratic restrictions (have to get a permit, sleep in shelters, etc), a lack of decent springs, the fact that I ate a bite of ‘cured’ pork that was actually raw, and the weather were the bad points. 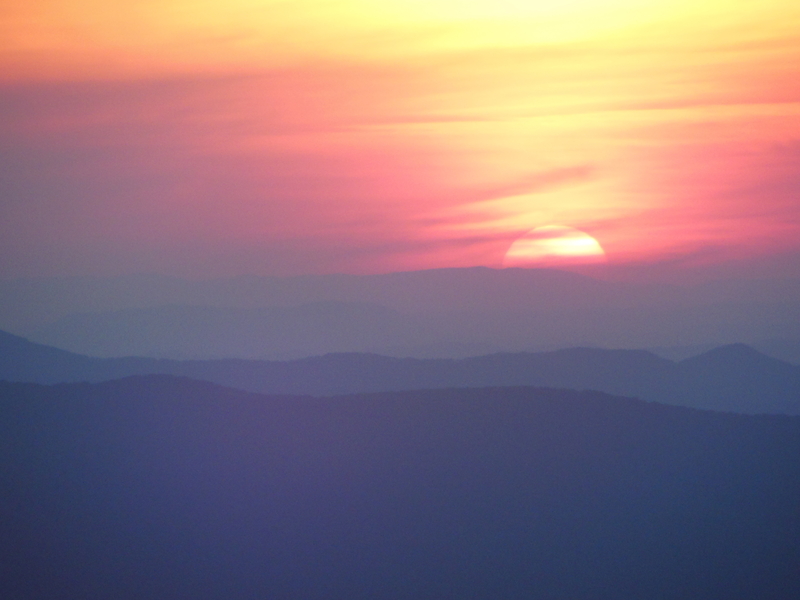 However, there were some really awesome high points in the Smokies. On my last day, I got a few awesome views where I just spent some time alone to look at it all. It’s strange to realize how small we are when we look out over such an expanse of land. It’s a powerful feeling, and one that I may touch upon in another entry sometime down the road. The other big highlight of the Smokies was that I saw a bear!!! I saw it from about 70 feet away, and I think it was only a cub, but hey – it still counts! He ran toward me about five feet before hopping off the trail and up into the woods. I didn’t have time to take a picture of him, and I didn’t see him again as I walked down the trail. Not the most exciting sighting, but it was a really neat experience. I also met a really cool dude named Cedric who I hiked with for most of the Smokies. So I must say, those highlights were definitely enough to counter the lower points of the Smokies. After leaving the Smokies, I stayed a night at a place called the Standing Bear Farm. This is one of the most unique places I’ve ever seen. It’s run by a guy named Rocket, and it’s really just a complex of about eight small shacks. There’s a privy, bunkhouse, laundry room (washboard/hand laundry), kitchen, beer shack, supply house, and shower house. It is hiker heaven pretty much. I got in there early that day so I could relax and drink some beers and eat tons of food. That’s one of the really neat things about the trail – the hostel life. Currently, I’m staying at a place called Elmer’s. It is much different from Standing Bear, but I like it all the same. Elmer owns an old Victorian house on the main street of Hot Springs. He cooks breakfast and dinner every night for his tenants, and he has books galore and a music room. This morning I had breakfast with everyone, then listened to music for about an hour. Elmer is a special guy. After teaching Eastern Religions at Duke, he hiked the trail in ’76, then moved to Hot Springs where he started working at the hostel. He’s been doing this for over thirty years! He’s a really neat guy, and it’s been a pleasure staying at his place. One last image/story I want to share. 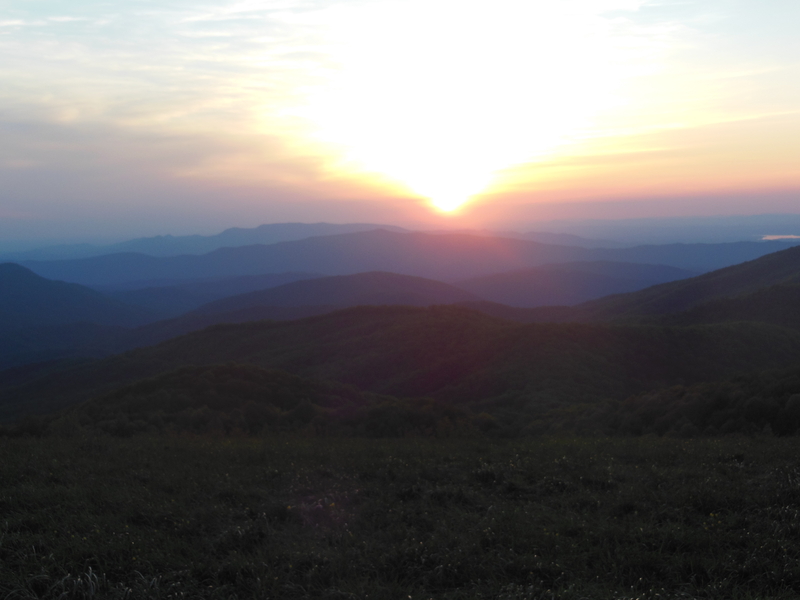 Two days ago, I reached a bald called Max Patch. 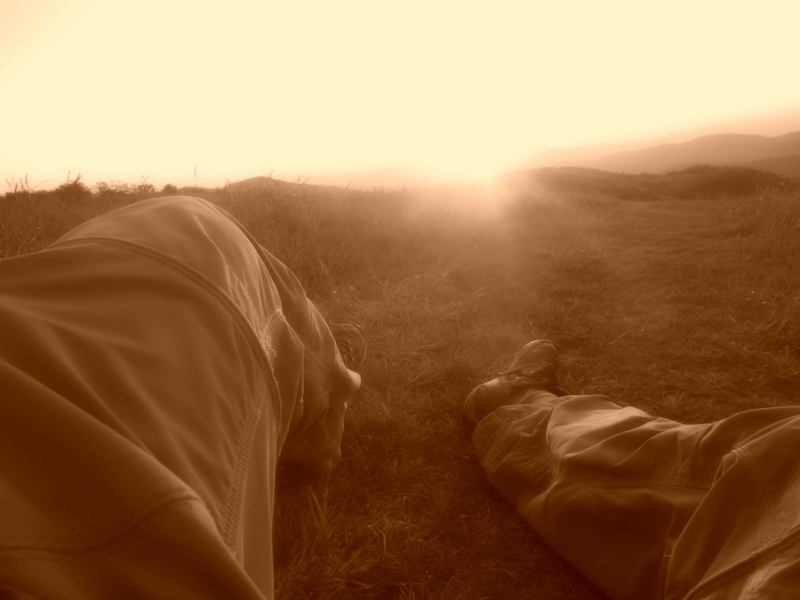 Me and Tangy camped at the base of it in order to watch the sunset and sunrise. The sunset may have been the most awesome thing I’ve seen so far. I took some pictures, but they do it no justice. I’ll share them anyway, but there is something lacking in them. 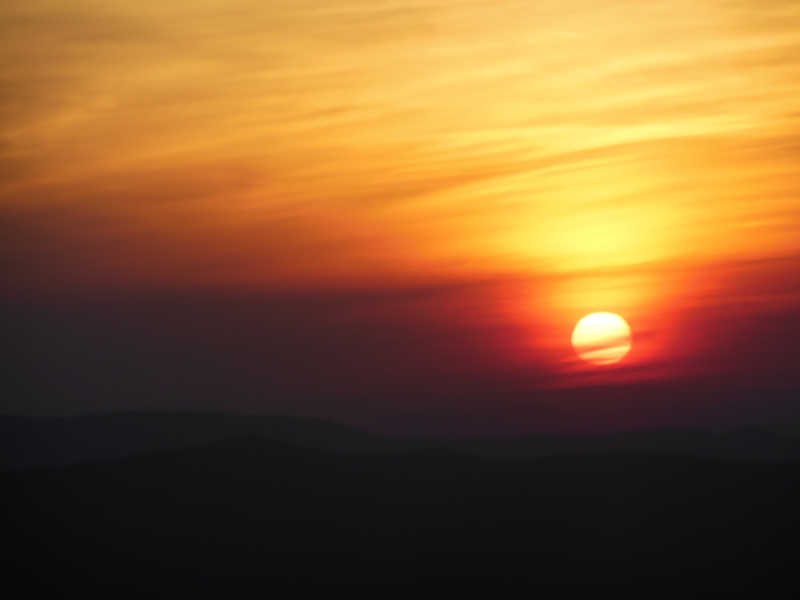 It was an awesome experience – take a look, it’s beautiful. Sorry to write another post so quickly on the heels of my last trail update, but I leave town tomorrow, and the library is closing here in an hour or so. What I wanted to write about quickly is what I refer to as Trail Gremlins. 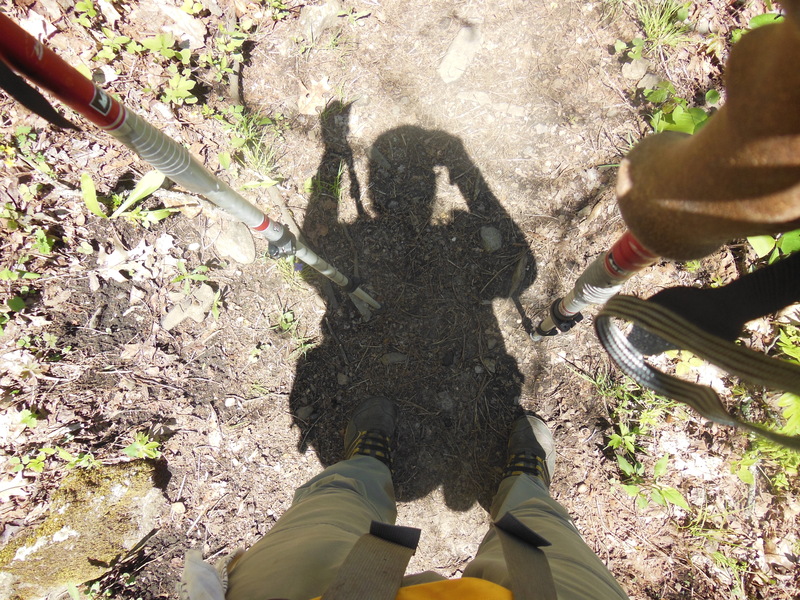 They go by different names as well – Trail Trolls, Pole Trolls, Dirt People, etc. Either way, these Trail Gremlins are little creatures that live right alongside the trail. They are highly mischevious, and at every opportunity they get, they’ll try to grab hold of your trekking pole and hold it fast. This obviously results in some annoyance for the hiker. It’s as if the earth is trying to swallow up the trekking pole as you’re trying to continually move along. Sometimes the Trail Gremlin gets a good hold of the poles, sometimes it’s not much at all. I shall explain below. So there are a couple of techniques to counter the grasp of the Trail Gremlins. If their grasp is weak, you can just turn the wrist inward while the pole is still out in front of you. This normally frees the tip of the pole, and you continue on your trek, no harm at all. If the Trail Gremlin gets a pretty good hold of the pole, the inward twist may not work. Your constant forward momentum will cause the pole to wind up still in the Gremlin’s grasp, but now behind your body. So your arm is outstretched backwards, like a wing. When in this situation, the way to free the pole is to twist the wrist in an outward manner while pulling upward. That should free the pole tip. Lastly, there are some occasions when the Trail Gremlin will get such a good hold that your countering actions fail completely. The pole will come out of your grasp and dangle from the lanyard on your wrist. If this occurs, the Gremlin has succeeded in his act, and recedes into the earth, never to be seen. No one likes when the Trail Gremlin succeeds. Now, I’m telling you all of this because I had a bit of a crazy event happen the other day. I actually got an image of a Trail Gremlin while in the Smokies. I was taking some first person type video of me just walking down the trail – so it was really just the trail and some trees in the video as I moved forward, just so I could show what walking along the trail looked like. Just then, a Trail Gremlin grabbed hold of my trekking pole. My inward and outward twisting failed, and I was spun around with devastaging force as the lanyard caught my wrist. By chance, my camera was at the proper angle so that I caught the Gremlin as he receded back into his smelly lair. I looked at the video over and over, but was unable to make out much of it – I could only see the blurry face of the creature. I sentthe video to the ATC (Appalachian Trail Conservancy) for their study and analysis with the hopes that this would shed some light on the Trail Gremlin issue. To my amazement, this was the first Trail Gremlin ever caught on either video or any imaging device according to the ATC. Through the fancy work of their tech folks, they were able to extract a high resolution image of the Gremlin from my blurry video. Below is what they found. They requested that anyone with information regarding the below image contact them directly. It is crucial that your reach out to them immediately if you have any information whatsoever. I’ll warn you, the image is somewhat disturbing, so I’ll place it a little further down on the page.